Why is the DOS needed? "During my silence, people responded in completely different ways. One person stopped me and thanked me for what I was doing for all the people who weren't able to. Another person told me that I was a pitiful excuse for a human being. I decided that the thank you was what was really important." "When a person says that they never notice a problem with LGBT people being forced into silence, they are choosing to be blind to it. This Day is a definite eye-opener." The Day of Silence® (DOS) was founded in 1996. At the University of Virginia, lesbians, gays, bisexuals, transgender persons, transsexuals (LGBTs) and supporters protested the atmosphere of bullying and harassment by simply remaining silent for the day. Since then, the silent protest movement has grown and now includes observances at over 8,000 middle schools, high schools, colleges and universities. The 15th annual DOS will be held on 2010-APR-16. 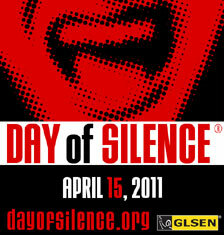 The "National Day of Silence" is held annually in mid April. It is sponsored by the Gay, Lesbian and Straight Education Network (GLSEN), in collaboration with the United States Student Association. 2,3 GLSEN promotes the creation of "safe schools for lesbian, gay, bisexual, transgender people and transsexuals." Later in the day, the participants attend "Break the Silence" events in which they celebrated the events during the day. Why is such an observance needed? 86.2% of lesbian, gay, transgender persons and transsexuals (LGBT) reported being verbally harassed at school during the previous year because of their sexual orientation or gender identity. 44.1% reported having been verbally harassed. 22.1% reported being physically assaulted. 60.8% said that they had felt unsafe at school. Rep. Engel said: "Sadly, violence and discrimination against LGBT youth is all-too-common in American schools. It is a national disgrace that students feel threatened in school simply because of their sexual orientation. As a former public school teacher, I am proud to introduce this resolution. Americans need to know that thousands of children each day go to school deprived of a happy adolescence because of the insensitivity and cruelty shown by some fellow students, teachers, staff and parents." "supports the goals and ideals of the National Day of Silence;"
"requests that the President issue a proclamation calling on the people of the United States to observe the National Day of Silence with appropriate ceremonies, programs, and activities; and"
"encourages each State, city, and local education authority to adopt laws and policies to prohibit name-calling, bullying, harassment, and discrimination against students, teachers, and other school staff regardless of their sexual orientation, gender identity, or gender expression, so that the Nation's schools are institutions where all individuals are able to focus on learning." It was referred to the House Judiciary Committee's Subcommittee on the Constitution, Civil Rights, and Civil Liberties where it died.